This is a fun and easy project to do, and looks so pretty when the sun goes down and it is lit up! I will show you the finished project first….but then something sparked in my brain (again) and I got another idea…here it is finished on my patio table. Now you can add shells to make it looked more finished. But….I thought of something else that the kids would get a kick of when they come over…. My dollar store solar surfer! Of course you may not have one of these…but if your container is big enough….you can fit something else. During the day he wiggles, then at night when the solar is on….the light makes him wiggle! It’s just too cute! But like I said if you don’t have a solar figurine, you can put shells inside. Tip: Right before summer, the dollar store gets filled with the summer solar figurines. I started with a piece of heavy wire to make the hanger. I am so sorry I didn’t take pics, but if you want the directions on how to make these hangers, I will be glad to show you step by step, just let me know. After the hanger was made I started gluing on the sea glass. I still have some left over from the ‘Dragonfly Makeover”. I had purchased a bag of sea glass from Walmart. This is a pic of the stone granules I used at the bottom…the sea glass I had left over from the ‘dragonfly’ project. The best thing is I finally figured out how to keep the glue from moving with the pieces until dry…..Why didn’t I think of this earlier…. I added the stone granules on the bottom. I am going to keep this on the table..maybe. I just think it is so cute with the surfer….I’m originally from the beach.So tell me…which way do you like it? 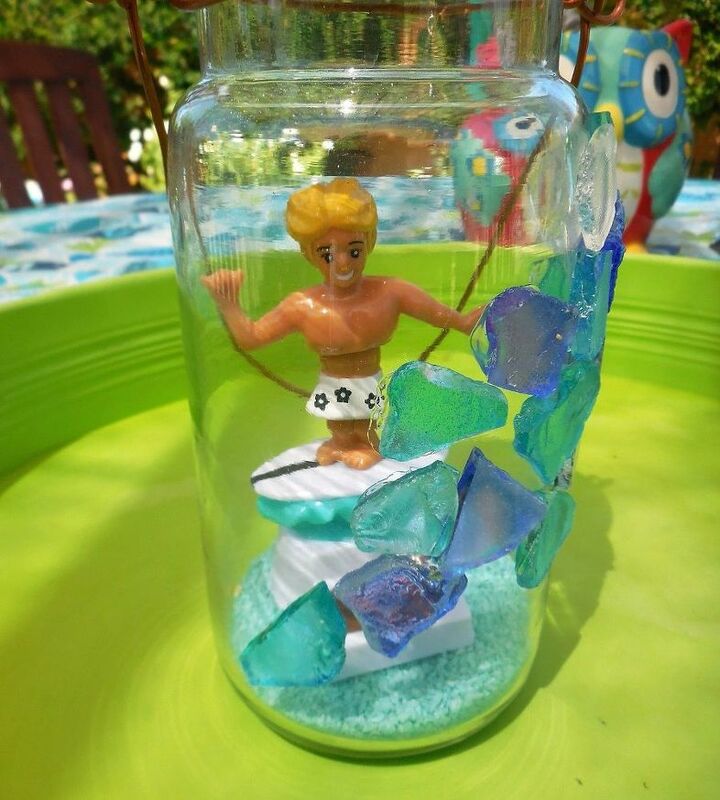 I know the kids are going to love it with the surfer!